Elastically deformable plastics have been necessary for several technical applications but also for various everyday objects. Per year, more than 12.7 million tonnes of these types of polymers are consumed worldwide. 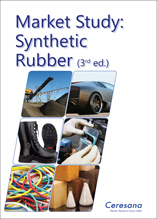 Ceresana analyzed the global market for synthetic rubbers already for the third time. These include styrene-butadiene rubber, butadiene rubber, ethylene-propylene-diene rubber, acrylonitrile-butadiene rubber, chlorobutadiene, and polyisoprene. The current study deals with data for the years starting in 2009 and forecasts data until 2025. The most important sales market for synthetic rubber in 2017 was the segment tires: 58% of total global demand were accounted for by applications in original equipment and replacement tires. Rubbers are also used for numerous other products in the automotive industry: for example for hoses, cables, seals as well as window and door profiles. For the automotive segment, the analysts of Ceresana expect an increase of global rubber demand by 3.0% per year until 2025.